Accessing Austen Part 2: What the Heck is a Pelisse? 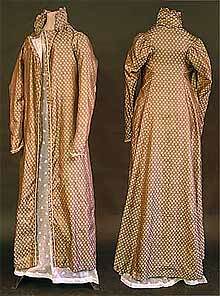 One of the reasons Jane Austen is a favorite in Hollywood, in my opinion, is the clothes. Costume drama is always much more expensive than drama that requires no period clothing or sets, but cost hasn’t discouraged adaptations of Jane Austen’s works. Depending on the fabric, making a dress would be very expensive, and according to Pamela Whalan (author of the first article), purchasing a dress made by a dressmaker would be about twice as much as making one’s own. One would probably have to purchase items like hats, gloves, shoes, and stockings because they required more specialized knowledge to make. In an interesting article about silk stockings, I learned that stockings were created either by “hand knitters or those using a stocking frame. Frame knitters were the ‘professionals’ in the business and could turn out 10 pair a week. Hand knitters averaged only 6 pair of stockings per week.” The article includes an illustration of a stocking weaver using a frame to make stockings. Perhaps these statistics explain why they were so expensive. Bonnet: A cloth or straw hat tied under the chin worn by women or children (Merriam-Webster Online). See Bonnets: High Style in the Regency for different types. Breeches: In the early Regency, breeches were pants worn at the knee (similar to Revolutionary War pictures of Washington, Franklin, and their fellows); later, the breeches became longer, eventually giving way to trousers similar to modern pants (see picture on bottom of post). Note: in England, “pants” are underwear and what Americans call “pants” are called trousers. Cravat: A man’s band or scarf worn around the neck or a necktie; see picture on bottom of post (Merriam-Webster Online). Drawers: In the late Regency period, women wore long pant-like undergarments called drawers (later on, bloomers). Drawers were cinched with a drawstring. Dressing Gown: A kimono or robe-like garment worn over a nightgown or nightdress, usually in the morning before dressing. Empire waist: This is the term we use to describe the high-waisted dresses and gowns worn by women during the Regency period. The waistline was sometimes as high as just under the bustline. Mantle: A loose, sleeveless cloak-like garment worn as outerwear (Merriam-Webster Online). Muslin: A sheer cotton material that became popular because it was easy to care for. Nightshirt: Over-large shirt worn to bed by both men and women. Parasol: Small umbrella-like shade carried by women to ward off sunlight and preserve the complexion; parasols would have been inappropriate for rain as their decoration would most likely be ruined and the materials would not have repelled water. Pelerine: A woman’s narrow cape made of fabric or fur and usually with long ends hanging down in front (Merriam-Webster Online). Pelisse: A dress-like overcoat that hung nearly to the hem of the skirt. The sleeves were close-fitting and long, and the collar was high. Pelisses were often trimmed with fur and lined with silk. Austen refers to pelisses in her novels Persuasion and Mansfield Park in addition to her personal letters. Left is a picture of Jane Austen’s own pelisse [via Hantsweb]. Petticoat: An underskirt worn much like a modern slip. Reticule (also called a Ridicule): A small, handmade purse or bag, sometimes ornamented with tassels or beads. Reticules were fashioned from a variety of materials and sometimes had drawstrings. Austen mentions a reticule in her novel Emma. Sarsenet (also Sarsnet or Sarcenet): A soft silk in plain or twill weaves or a garment made of such (Merriam-Webster Online). Austen mentions sarsenet in Northanger Abbey. Spencer: A short jacket that fell to the raised waistline. Worn by both men and women, this jacket was a warmer weather jacket than the pelisse. 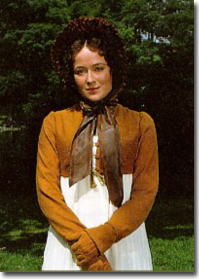 To the right, Jennifer Ehle as Elizabeth Bennet wears a Spencer jacket in a movie adaptation of Pride and Prejudice [via The Jane Austen Centre]. Tailcoat: A man’s coat with tails similar to some types of tuxedo coats worn today. Tails on tailcoats are long and taper to a point. 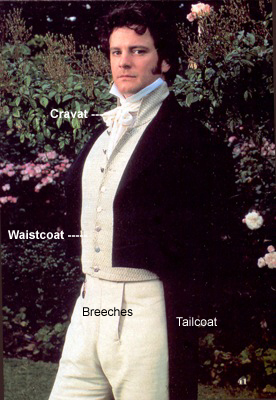 Tailcoats often fell to the waist in the front (see picture on bottom of post). Train: Trailing fabric at the hem of a dress most often seen today in bridal gowns. Waistcoat: A men’s vest, sometimes double-breasted, worn under the coat (see picture on bottom of post). Tools I used to figure out cost equivalents are a currency converter set at 1810 (UK National Archives) and a Google currency converter from British pounds to American dollars. According to the article, Jane Austen herself actually paid 6 shillings for a handkerchief and 4 shillings for gloves and mentions it in letters dated from 1813. “Regency Fashion” at the Jane Austen Centre. This post is the second in a series on teaching Jane Austen’s novels. Wow, $40.00 for silk stocking. No wonder why they are mentioned with reverence in many novels! I wonder what a new pair would cost today if they were available retail? $100.00?